Ongoing research in nanotechnology promises both innovations and risks, potentially and profoundly changing the world. This book helps to promote a balanced understanding of this important emerging technology, offering an informed and impartial look at the technology, its science, and its social impact and ethics. Fritz Allhoff is Assistant Professor in the Department of Philosophy at Western Michigan University, where he also holds an affiliation with the Mallinson Institute for Science Education. He has held fellowships at the Center for Philosophy of Science at the University of Pittsburgh and the Centre for Applied Philosophy and Public Ethics at the Australian National University. 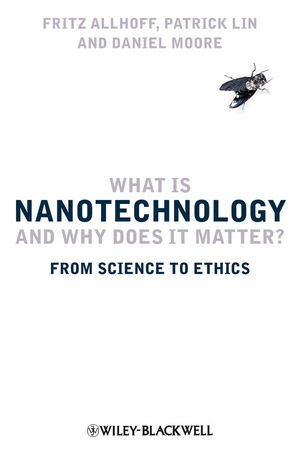 He has edited more than 20 books, including two on the social and ethical implications of nanotechnology. Patrick Lin is the director of Ethics + Emerging Sciences Group at California Polytechnic State University, San Luis Obispo, and holds academic appointments at Dartmouth College, US Naval Academy and Western Michigan University. He is also lead author of a recent major report funded by the Department of Navy entitled Autonomous Military Robotics: Risk, Ethics, and Design (2008), as well as other publications in technology ethics, including edited anthologies on nanoethics. Daniel Moore is a research scientist on nanoscale semiconductor solutions for IBM. He served on the Georgia Institute of Technology’s honor committee and has received numerous fellowships, including the Molecular Design Institute Fellowship, the GT Nanoscience and Technology Fellowship, the School of Materials Science and Engineering Advanced Publication Award, the NSF STEP Fellowship, and a Sam Nunn Security Fellowship. His professional experience includes nanoscale research in other leading industry laboratories.